feminism – Can You Relate? Here’s a great story: Malyk Bonnet, a really smart seventeen-year-old, saved a women from her violent ex-boyfriend. A look at some of the creative and powerful ways communities have responded to sexual violence outside of the justice system. A lost film has resurfaced showcasing the kickass feminists who agitated at the 1972 Democratic convention: Shirley Chisolm, Bella Abzug, Betty Friedan and more! A few days after the book arrived, I was sitting in a heap of unfolded laundry and turned to my favorite laundry helper (Netflix) to get me through. So I was watching the PBS special on Billie Jean King when my daughter came in and excitedly said, “Mama, she’s from the book!! !” It took me a second to realize what connection she was making but when I did, I invited her into the fold (see what I did there?) and we watched for a while. She was thrilled to know about her and be in on something special. We talked about how bold Billie Jean King was and all the other women and men that helped her achieve such greatness. And we dreamed. We dreamed for a future where we have pay equity—not just at Wimbledon, but everywhere. We celebrated. We talked about how I once got to see A is for Angela Davis speak and how I hoped we would continue to go to protests and marches together and live our lives in a way that exemplifies the ideals of which she spoke. And we appreciated. We took time to be grateful for all that we have because of leaders who had the guts to work for equality. And then we got up and went outside to play ball. Because we could. 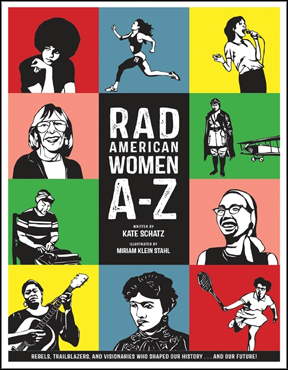 Here’s to the other rad women of the book and to the rest of us still out there working for justice!